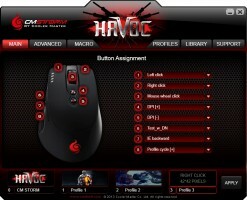 The Havoc body is a palm mouse that is covered with a rubber paint coating and complimented by a rubber thumb grip. 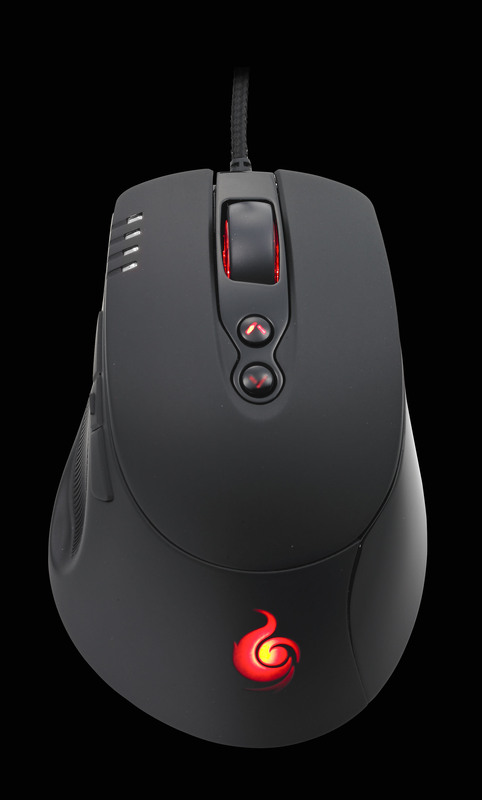 This adds to the mouse’s overall stability, combats slippage well, and has a generally nice feel to it. I actually found myself feeling more comfortable making the slighter swipes while grasping the mouse between my thumb and pinky primarily. I probably found myself moving the mouse with my fingers more so than my actual palm due to the mouse’s light weight of 0.3 lbs. The mouse’s 1.8 meter cord is threaded which is good for countering potential wire snags. The 8-button layout has 3 buttons on the side right over the rubber thumb grip, 2 behind the mouse wheel on top, the mouse wheel itself, and the standard left and right clicks. All buttons backed with Japanese Omron micro-switches, boasted for sustaining over 5 million clicks. 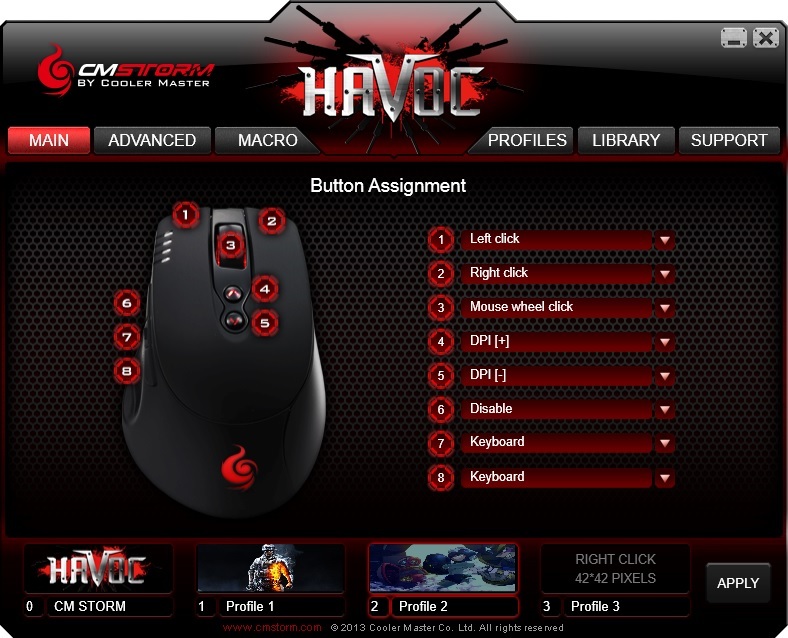 The Havoc‘s button layout itself is pretty standard for an 8 button mouse. One gripe I had was the need to adjust my hand placement when negotiating between buttons 6 and 7 or between 4 and 5. There was a slight learning curve to learning how to address the buttons accurately, but practice made perfect. 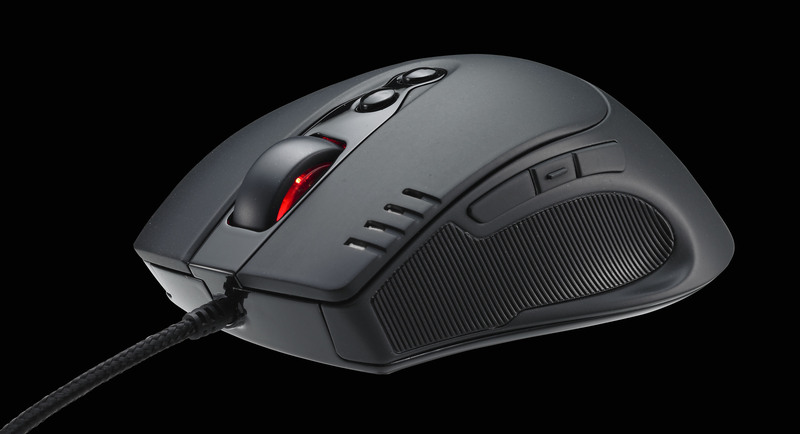 The mouse uses an Avago 9800 laser sensor that sports up to 8200 DPI of sensitivity. 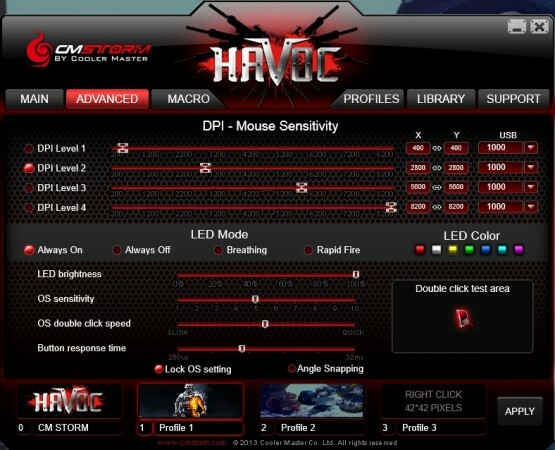 As for the LED’s, you have 4 placed well on the left click button to indicate which DPI level you are at (depending on your profile), one within the mouse wheel, and one illuminating the CM Storm logo towards the rear of the base. The color of the LEDs’ can be changed between 7 different color choices. Overall, “ideal” mouse comfort is a matter of personal preference. Even semi-seasoned PC gamers need to make personal distinctions of whether they prefer palm or claw grips, or whether they want heavier or lighter mice. So to understand my assessment of the Havoc‘s level of comfort, it should be said that I prefer a heavy palm grip mouse. That said, a favorer of palm grip mice can get used to holding this mouse efficiently after a short time, after which absolute comfort is achieved. Almost any serious gaming mouse of today must have some programmability. Where you dive deeper is how that programmability is executed and how thoroughly. Here you have an on-board memory of 128KB for storing 4 profiles worth of settings where all 8 buttons can be customized (via a Havoc software console). Between those profiles, you can segregate the full identities of the Havoc. Specifically, you can customize the 8 buttons, the differing levels of DPI sensitivity, the LED colors and how they display, and lay out your macros. In a quick test of the on-board memory, I loaded a profile with specific settings for buttons 6, 7, and 8 onto the mouse. I unplugged the mouse and connected to another Windows 8 PC (where the Havoc console software was not installed). After Windows installed some basic rudimentary mouse drivers, I was able to use those programmed buttons exactly as the profile dictated. 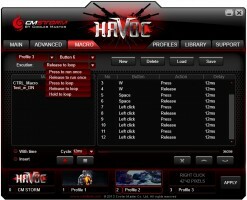 No need to install the Havoc software on every PC you intend to use your pre-loaded settings on. 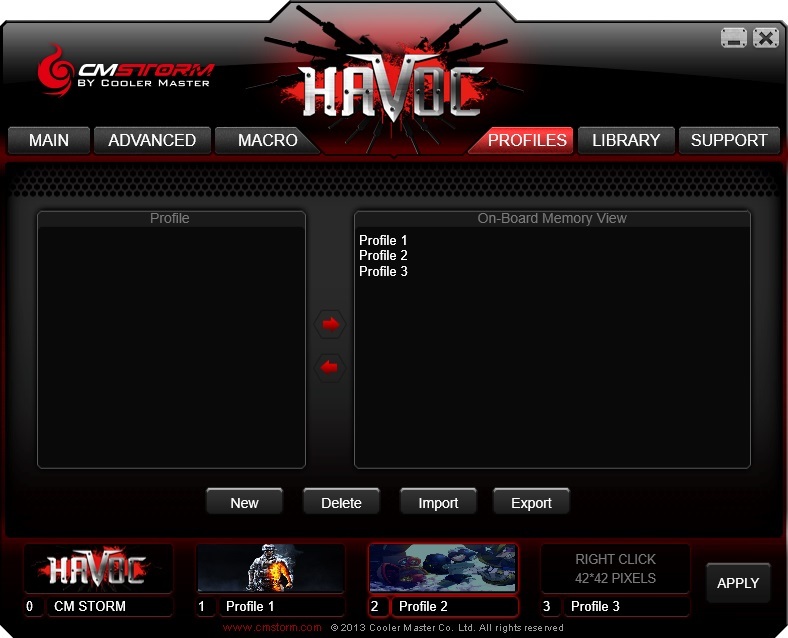 In the Havoc console, you can even go as far as to customize the different images for your varying profiles – just choose an image of any size and the application will resize into thumbnails as seen below. Aside from convenience, one of the main uses of on-board memory in a mouse is for macro storing and usage. The point being that the mouse will perform all of the actions as defined in the macros directly, superseding macro detection in the games that have it. Macro detection primarily looks for applications that run either in conjunction with or during the games in where they are used, then acts accordingly. However, if the actions are appearing to come directly from keyboards and mice (as they should), then all is well. I ran a quick test seen below in a Nexon game, Dragon Nest. I chose Dragon Nest specifically since Nexon runs AhnLab Hackshield noticeably in the corner whenever any of their games are played. I was able to perform a simple dash, jump and dive attack all at the singular press of button 6 without so much of a huff from the game. 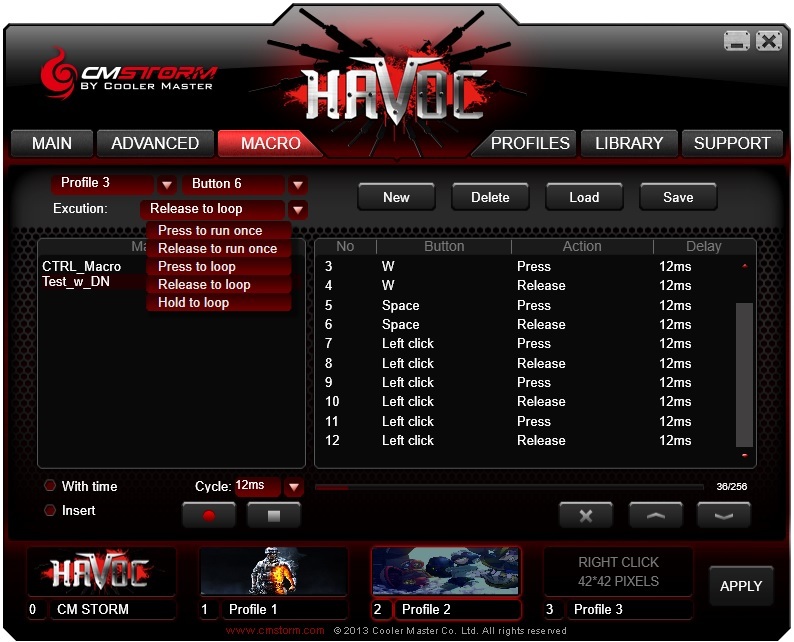 While the Havoc didn’t come with any specific instructions on how to use the macro creator (or any of the other aspects of the Havoc console software), the majority of the functions are somewhat self-explanatory and intuitive. However, those new to function-stuffed gaming mice may not catch on to console’s more advanced functionality right away. That said, above I created a very simple macro for what I used in Dragon Nest by using that “record” button seen in the above screenshot on the left. Once pressed, the console will start to record every single key you press or click, when you pressed it, and for how long you had the key pressed. On the upper left you can set the behavior of the macro with a drop-down menu; Do you want the run the macro in a loop or maybe once when the button is simply pressed? You can do some minor touch-ups in order or step deletions after you click stop. You can then save and name your macro to be applied to a specific mouse button later. For the most part, when you are looking to spend on features like these, you are endeavoring to pay anywhere between $70 to $100. Instead here, you are paying less for a product that delivers what it promises. The gripes expressed were minor ones that one gets past over time. And with gaming mice generally being circumstantial in terms of overall review, one can only express their thoughts on them from their own standpoint. From mine, the outlook is good. You have a product with all gaming nuances considered in an intriguing fashion. Although, it could have used a manual to help the inexperienced. You DID at least read this far, so you must have learned something from me, no? 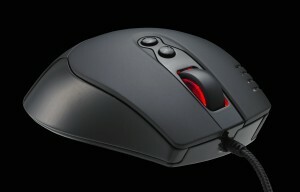 And should you want to try this mouse out, you may want to consider on of the CM Storm pads. I had the privilege of trying this mouse out with the Power RX, a 350 x 450mm surface area pad with a special rubber compound – a smooth ride indeed. † Actual Havoc mouse images acquired from CM Storm’s product page.